Is Netanyahu about to lose the election? The Likud party is losing the election. That’s not the assessment of pollsters or analysts but of Likud itself, which has spent much of the last few days in an increasingly frantic scramble to warn right-wing voters that voting for any other right-wing party could lead to a left-wing government. “We might wake up in a week and find that Tzipi [Livni] and [Isaac] Boujie [Herzog] are prime ministers of Israel,” Netanyahu himself warned in a campaign video Wednesday after multiple polls showed Likud dropping to 21 seats while the rival center-left Zionist Union rose to 24 and even 25. That scenario is “a real danger,” warned Likud MK Yisrael Katz. “When the right was split in 1992, it brought the Oslo Accords. In 1999, it brought the [Ehud] Barak government,” a Likud statement warned ominously, urging supporters of Jewish Home, Shas, Kulanu and other parties to switch to the center-right mainstay in order to avoid a similar calamity. So is it true? 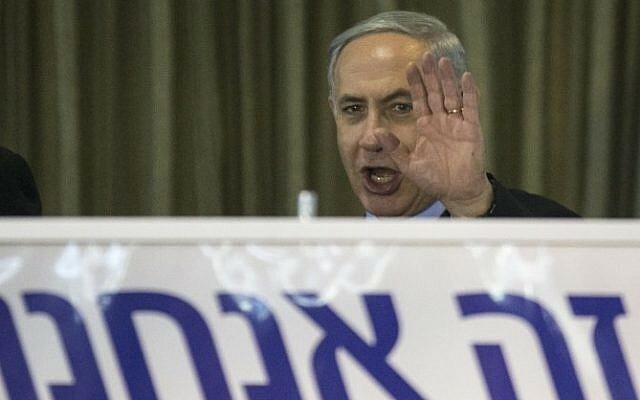 Is Likud, the ruling party for six straight years, now in danger of losing the election? And is the storied Labor Party, which leads the Zionist Union slate but has not won an election in 16 years, finally poised for a comeback? The short answer: Likud’s situation is indeed precarious, but as of the most recent polls, and assuming its decline stops at or near the current level, it is still the front-runner in the race. To understand why this is so, one has to fast-forward to 10 p.m. on Tuesday, when the ballot boxes are finally closed, the campaign volunteers cease their canvassing, the hail of text messages urging voters to cast their ballot peters out, and a radically new game begins. It is the moment when the rhetoric ends and the politics begin. If the results of Election Day are similar to the results of the average of the last five polls, as compiled by Project 61 — Zionist Union, 24; Likud, 22; Joint (Arab) List, 13; Jewish Home, 12; Yesh Atid, 12; Kulanu, 9; Shas, 8; United Torah Judaism, 6; Yisrael Beytenu, 5; Meretz, 5; Yachad, 4 — then a few hard political realities are clear. One: A left-wing coalition cannot be formed. The most natural coalition of Zionist Union-Yesh Atid-Meretz yields just 41 seats, 20 short of the 61-seat majority. The Arab Joint List won’t save this coalition. For one thing, its 13 seats (assuming no last-minute spike in turnout, something some pollsters say is actually likely to happen) only bring the leftist coalition to 54 seats. For another, the Joint List is anything but united. The nationalists of Balad clash profoundly with the socialists of Hadash, and are likely to splinter the list rather than support a coalition led by Zionists, even if they are left-wing Zionists. A left-wing coalition will need bolstering from the ultra-Orthodox parties, the centrist Kulanu or even Yisrael Beytenu to obtain a majority. But each of these options creates as many problems as it solves. In each case, a party is being asked to overstep one of its major political taboos. The ultra-Orthodox have said repeatedly they will not join a coalition with Yair Lapid’s Yesh Atid – and since their primary demand for joining the coalition will be the dismantling of Lapid’s signature ultra-Orthodox enlistment reform from the last government, it’s hard to see how Lapid could sit with them even if they agreed. As for Herzog: Winning the 14 seats of the ultra-Orthodox while losing the 12 of Yesh Atid does not bring him much closer to victory. Yisrael Beytenu and Kulanu will have a similar problem joining such a coalition. Namely, that neither can afford to be the party that allows the establishment of a government that relies for its survival on anti-Zionist Arab lawmakers. If Herzog cobbles together a majority of 61 MKs, Kulanu’s Moshe Kahlon and Yisrael Beytenu’s Avigdor Liberman will likely add their combined 14 seats to make that majority impregnable. But they will not willingly become the enablers of a government propped up by political forces they consider anathema. And as with the Haredi-Lapid conundrum, here, too, Herzog’s choices aren’t great. Rejecting the Arab list’s 13 supporting votes (assuming he can bring in all 13 in the first place) in favor of Kahlon and Liberman’s 14 will only advance him by one. The best-case scenario for Herzog, then, is a coalition made up of Zionist Union, ultra-Orthodox parties, Meretz, Kulanu and Yisrael Beytenu (for the purposes of simplifying, we’re leaving out some other challenges posed by such a coalition, such as Liberman’s and Meretz’s mutual vows to not sit together in any coalition), for a total of 57, just shy of success. Again, if he then calls upon Arab votes to put him over the top, he almost certainly risks losing Liberman, and quite possibly Kahlon as well. 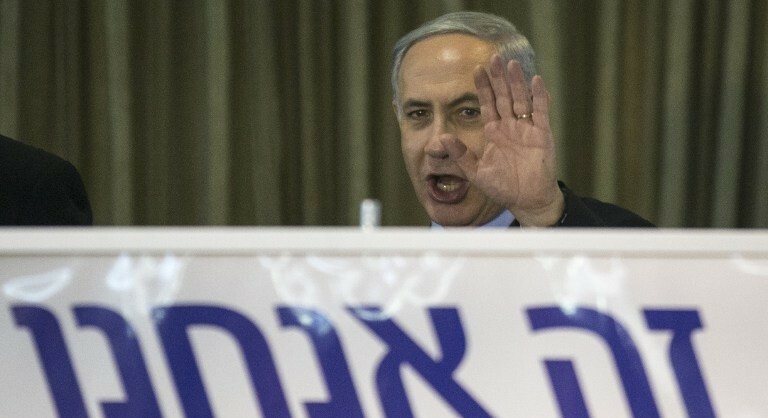 Two: Likud’s path to a coalition is within reach, even with its latest decline. A more-or-less staunch right-wing coalition of Likud, Jewish Home, ultra-Orthodox parties, Kulanu, Yisrael Beytenu and Yachad comes to 66 seats. With the exception of some tensions between Yisrael Beytenu and the ultra-Orthodox over the draft bill and other issues related to religion and state, there are no major political taboos or ideological hurdles to forming such a coalition. Three: The known unknowns all favor Herzog. If that were the end of the story, Likud would not be in a very real panic. Before right-wingers breathe that sigh of relief, a few potentially decisive caveats are in order. Every election in recent years has seen a surprise rally of four to six seats on Election Day – and never on the right. The Pensioner’s Party rallied from two seats to seven in 2006, Tzipi Livni’s Kadima from 25 to 28 on the last day of the 2009 race, Lapid’s Yesh Atid from 14 to 19 in 2013. Every single political actor in this election – including and especially Netanyahu – has spent the past week redoing the math for a Herzog-led coalition with a five-seat Election Day boost. The left’s ground game is noticeably better than the right’s. In past years, left-wing parties proved mostly incompetent in mobilizing volunteers and activating their base to urge like-minded voters to the polls. This year, with groups such as V15 and a host of other grassroots initiatives deploying many thousands of activists to canvass areas where left-wing voters live, that trend has been decidedly reversed. The right has railed against the (now certifiably legal) foreign funding these groups have drawn, but has failed to do what it once did best – to respond in kind. The legions of national-religious youth and right-wing activist organizations that flooded the streets of past elections are noticeably absent this time around. With so few seats missing from a left-led coalition, this gap in the get-out-the-vote arms race could prove decisive. Likud’s decline may continue. This article paints a fairly rosy picture of Likud’s situation because this writer chose to use an average of five recent polls to offset possible statistical fluctuations. But the latest poll in the average is worse for Likud than the earliest one. If the decline of recent days proves to be a trend, rather than a statistical blip, Election Day could prove sobering indeed for the ruling party. Four: There are limits to President Reuven Rivlin’s ability to force a unity government. There has been a great deal of talk in this election about the possibility that President Rivlin might force Netanyahu and Herzog into forming a unity government with a rotating premiership. How? Simply by telling each that if they don’t agree to a unity government, he’ll offer the first chance at forming a coalition to the other. The problem for Herzog is clear: as long as he remains five to eight seats short of any possible coalition, Netanyahu can simply call Rivlin’s bluff, Herzog will get his 60 days (45 plus two weeks’ extension) to try to cobble together a coalition, and then, if Herzog fails, the president will be left with little choice — either call a new election just two months after the last one, or give Netanyahu alone the chance to form a coalition. Given the caveats listed above, it’s not clear Netanyahu will want to take that chance. It depends on how far Herzog is from a potential coalition after Election Day, and, in no small part, on Netanyahu’s political courage. In any case, Netanyahu’s insistence that he would decline a unity government under any circumstances may soon be put to the test. If the political winds continue to tilt in Herzog’s favor in the coming days, Netanyahu, Israel’s second-longest-serving prime minister, may soon rue the haste with which he toppled his third government last December and turned to the Israeli voter to ask for a fourth.